One of the great pleasures I derive from being a jeweler is the occasional new design project that involves an old piece of jewelry. In this case, grandmother’s ring is being dismantled and the diamonds are to be used for a new set of wedding rings. I recently met with a young couple that needed wedding bands for their August wedding. 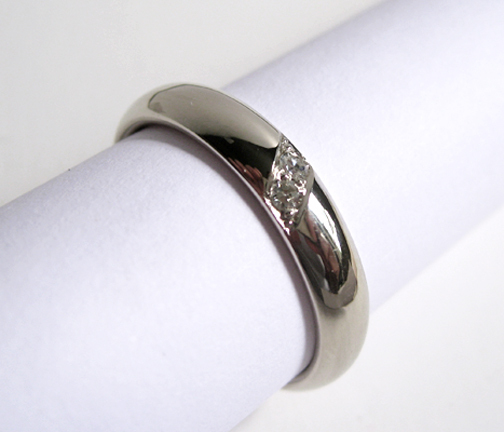 The groom to be had already given his fiancée a solitaire diamond engagemant ring. 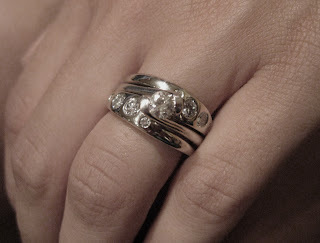 The bride to be had been given her grandmother's diamond wedding ring to be used for a new wedding band. The design challenge for me was to create a new band and to use most or all of the diamonds. Also, I would be providing a wedding band for the groom. The engagement ring is a somewhat modern style of heavy round wire that wraps the finger, twists a bit and holds the diamond with two wide bezels. A standard flat band would not lie against the side evenly. 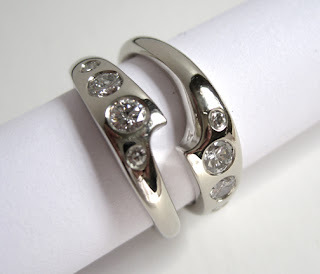 I ruled out this option because over time the wear on the rings would be very uneven. 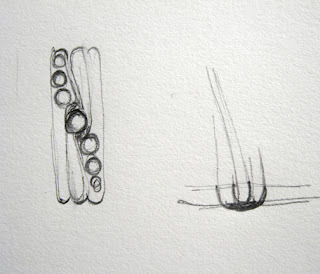 Since wedding rings are worn together continuously for years, it is important when designing them to pay close attention to where the metal touches and how they nest together. The solution was to make two diamond bands to be worn with the solitaire. There were enough stones to create a great look. 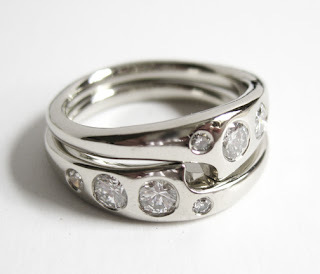 And, it was decided that two small stones could be used in the groom’s band too. I made two rings in wax then photgographed them with her ring. 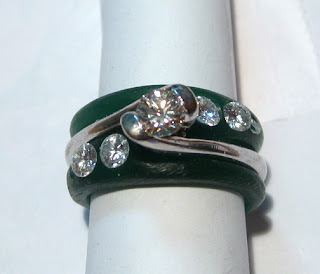 Two carved wax rings with diamonds positioned in place. Two cast 14k white gold rings, semi polished and ready for settting. Old ring mounting. 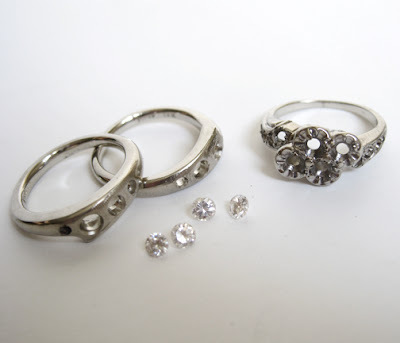 Another design consideration was to set the diamonds flush, burnished rather than pave with bright cut and beads. 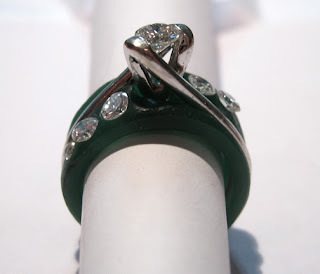 This style of setting compliments the existing solitaire which has a clean modern style. Finished rings. Shows where engagement ring will fit. 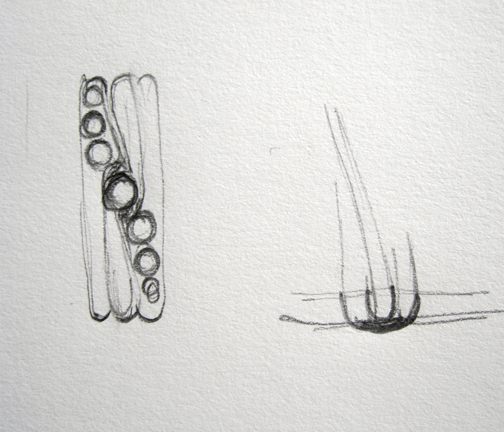 Trio of rings. Design by Mimi Favre 2011. The groom opted for traditonal pave for his band. 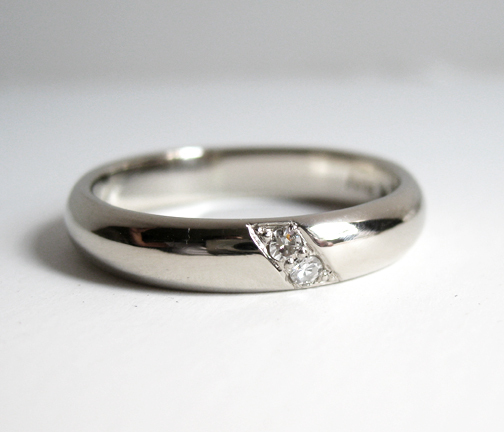 Just like the original sketch, two stones have been set in the grooms wedding band on the diagonal with a slight arc in the bright cut. Grooms wedding ring with two small diamonds.